It's been fascinating to watch the torture apologists as they have progressively changed their rationale for defending the brutal, illegal "enhanced interrogation techniques" of the Cheney regime. First, they told us that it simply wasn't torture. That all we did was turn the music up a little loud, disturb the detainee's beauty sleep, and scare them with harmless insects. Remember Huckabee laughing about how he had seen scarier bugs in some of the hotels he'd stayed in down south? But then it became clear that waterboarding, wall slaps, stress positions, mock executions are actually...well, forms of torture according to international and American law. So they changed. Rather they backed off a bit. Call it torture, they said, but it (they prefer to call it EIT's) was conducted "safely", under the auspices of the dictates of the memos from the Office of Legal Counsel. There was a legal protocol. Nothing was done outside that protocol, they stated. But then it became clear that the OLC memos were created in bad faith, that there was political pressure from the executive branch to retrospectively provide legal cover for a torture program that had already been decided upon. And in this exchange, we see proof from the monster himself that the OLC memos were entirely irrelevant. WALLACE: So even these cases where they went beyond the specific legal authorization, you're OK with it? The "effectiveness" of the torture program will never be known. Certainly some crucial intelligence was gleaned from suspects waterboarded. But not all our detainees were high level Al Qaeda operatives. Many were young men rounded up on the fields of Afghanistan. Not every detainee held crucial ticking time bomb information that only torture would release. And even those high level detainees (KSM, Abu Zubaydah) gave plenty of intelligence via standard interrogation techniques. The recent CIA documents do not differentiate the relative effectiveness of torture vs. legal interrogation methods. The evidence isn't there. Even Cheney knows it. And how does one wade through the mounds of unreliable intelligence that torture reaps? When your prisoner will say whatever it takes to make the pain or psychological torment stop, how do you determine which data is valid, and which is superfluous? Again, the CIA documents fail to provide a helpful algorithm. So here we are, several months into the scandal and it's still considered "controversial" that our current Administration would dare to launch an investigation of our previous torture policies. It's partisanship, they say. Obama is just trying to score some points. We still have stooges like the Washington Post and Chris Wallace and FoxNews claiming everything was legal and, besides, it saved American lives. You all should shut up and be thankful that we took on the burden of torture to protect your soft, liberal weakling asses! It's sad, really. It's sad to watch our moral spirit be degraded to such an extent. The fact that this has devolved into an actual debate, that we are actually debating whether or not a state-run, bureaucratized torture program was a good thing, is just heartbreaking. I'm embarassed. And to watch Chris Wallace in the clip above, retorting that "it's just a coincidence" that we haven't had another 9/11 since Cheney decided to torture suspects, implying that torture is the fundamental linchpin in protecting us from another attack, well, I would think that given the chance, those 4500 American soldiers who have died in Iraq and Afghanistan would beg to differ, that they died instead for the idea of a United States of America that stands for freedom, liberty, democracy, and the rule of law. And this is the tragedy of the Cheney regime--- this dark legacy which casts a shadowy pall over the memories of our brave men and women overseas. Daphne Eviator from the Washington Independent makes the argument that tort reform is unlikely to have any quantifiable effect on overall healthcare costs. She cites law professor Tom Baker's book, the Medical Malpractice Myth, and a 2004 Congressional Budget Office report as evidence that medical malpractice, at most, only accounts for 1.5-2% of total healthcare spending (not including any rational computation of defensive medicine). The implication is clear--- if tort reform isn't going to help control skyrocketing costs, then why bother spending the political capital necessary to fix it? First of all, the notion that because defensive medicine is notoriously difficult to account for by any objective computational method does not henceforth imply that the costs are irrelevant. It's difficult to measure, no doubt. But a CYA mentality is so ingrained in the practice habits of most American doctors that half the time we don't even realize we're doing it. That 24 year old female after gallbladder surgery who complains of chest pain and has a history of anxiety. Reflexively, I find myself ordering a troponin and EKG, knowing full well that there is no actual MI to rule out. The internist who obtains an infectious disease consult on a demented lady with a UTI when he knows the ID doc will just order the same antibiotic he himself would have written for. It's pervasive. No one wants to get caught having "not done enough", lest the trial attorneys start circling. It isn't enough to meet the standard of care anymore. We seek to exceed the standard of care in most cases, without knowing what in the hell that actually means. But anyway. I'll play devil's advocate to myself for just a second. Let's say I concede the supposition that the costs of defensive medicine are grossly overestimated. Maybe Tom Baker is exactly right. But my next question would be: who cares? Who cares whether or not defensive medicine is a costly burden on society. First of all, why would anyone in their right mind think that malpractice expenditures would ever exceed more than 1-2% of total health care costs? We spend trillions of dollars on health care in this country. Even if billions are wasted on frivolous lawsuits and malpractice insurance, that total is always going to be a mere drop in Lake Erie compared to the sum total. If malpractice costs were 20% or 30% of the total cost, this country would have no doctors. It would be the laughing stock of the world. It will never happen. Mathematically it is an impossibility that medical malpractice would ever comprise a substantial percentage of our cost burden. So it's a straw man argument. Secondly, since when did the relevant cost of an unjust or inefficient system become the sole determinant of whether or not it ought to be reformed? Petty theft from your local Wallmart or Sears does not affect corporate America's profit margins. So why do we have laws making it illegal to steal? Why not ignore all theft less than $10? Sometimes it's more expensive to hire more security and improve a store's surveillance technology than it is to just accept the minor theft as losses every month. So why make it a crime? Preserving order and justice in society via no tolerance anti-theft laws just doesn't make sense from a purely fiscal perspective. But we do it anyway to preserve the rule of law. The current contentious, highly litigious environment makes it very difficult to be a practicing physician in America. You can be sued at any time for any perceived slight. Outcomes, rather than actual negligence, are what drive patients into the arms of plaintiff's attorneys. And outcomes are the gripping, poignant reminders of human and, by extension, physican, fallibility. No one is interested in hearing about how you ordered this and that and pursued diagnosis X all in good faith. What they care about is the picture of the smiling grandmotherly woman who is now dead following elective colon surgery. The video of the young child with cerebral palsy struggling to feed himself. It becomes a spectacular show trial with an emphasis on the subjective loss and emotional turmoil of the plaintiff. Don't get me wrong. Physicians make errors. There are negligent doctors in this country. And those who fail to meet the standards of care ought to be held accountable. But not like this. Not with this wild west, lotto-style system of hired gun "experts" and charismatic attorneys and juries comprised of laymen who couldn't tell you the difference between an aneursym and a stalk of asparagus. It's a nonsensical, jackpot-geared system that rarely provides true justice even in cases of physician neglect. As physicians, we aren't asking for much. All malpractice claims ought to be handled by a panel of appointed experts. These panelists ought to be professionals, former practicing physicians who are less likely to be swayed by a crying mother or a high profile plaintiff's "expert" who hasn't practiced medicine in 10 years. Moreover, there's no reason not to cap punitive damages. Compensatory damages are already uncapped. So if you're a professional baseball player whose doctor prescribed a medicine which made you go blind, your compensation will be for whatever your losses would be from not playing professional baseball. Punitive damages are what make medical malpractice attractive to plaintiff's attorneys. Not all clients are million dollar baseball players. It isn't lucrative enough to spend the amount of time required by a major malpractice trial to justify chasing every ambulance if attorneys don't have that carrot of a million dollar verdict hanging at the end of the stick. And that's it. That's my proposal. Make it more of an arbitration process where the details of the case in question are evaluated by expert panels and judgements are determined in an objective fashion. And then cap punitive damages. It's very simple. I don't claim that fixing malpractice will solve our cost problem. But it will make doctors sleep a lot easier. It will reduce the often times adversarial relationship that can develop between doctor and patient. It will eventually lead to a reduction in the absurd practice of defensive medicine whereby a doctor is forced to do something that he knows is unnecessary but the spectre of future medicolegal entanglements overrides his clinical judgements. With the expansion of the safety net and the resultant millions of Americans who will need doctors, is it asking too much to cede to us this important request? We need more internists and general surgeons and primary care physicians. How are we going to lure them into our noble profession without some sort of tort reform? Why is it being shot down just because it may not have any effect on total healthcare expenditures? The fact that you will not find any reference at all in HR 3200 to tort reform is an act of aggression and base cyncism on behalf of President Obama and the architects of reform in Congress. They are essentially telling us that we are not important. Yeah yeah, we'll freeze cuts in Medicare reimbursements, they say. You should be happy just with that. Hey, I'm in the Reader's Digest (September 2009 issue). Look for me next time you're sitting in your dentist's waiting room. This was an interesting scenario. Little old lady falls down a week prior to presentation. She develops progressively worsening abdominal pain. She notes her urine is bloody. One day, her son is visiting and she gets dizzy and collapses. He brings her in to the hospital. When I see her, her entire lower abdominal wall is erythematous and indurated. She's frankly septic and in acute renal failure. 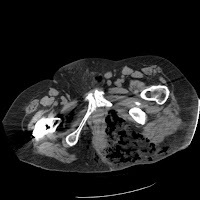 Because of the fall mechanism, we sent her for a CT cystogram (contrast infused via the foley catheter). 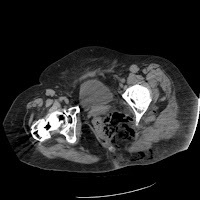 The images above demonstrate an impressive extraperitoneal bladder rupture with extravasation extending along the anterior abdominal wall. With the 2009 NFL season right around the corner, I've been gearing up for another season of fantasy football with my old medical school chums. I know, very uninteresting information. But two of them happen to be primary care physicians in the Cleveland area. One, David Fantelli MD, works as an internist in private practice just south of me. The other, Jeffrey Harhay MD, is an internist employed by the Cleveland Clinic Foundation on the west side of town (and also the defending fantasy league champ). Given the hoopla generated by Dr. Gawande's recent expose' article in the New Yorker on private vs. employed medical practice in McAllen, Texas, I thought it would be cool to do my own little investigative report from the heart of the Rust Belt. I sent Dr. Harhay and Dr. Fantelli an individualized set of questions regarding their practice patterns and the challenges facing primary care. Both spent a lot of time contemplating and answering. They took it very seriously, which I appreciate. I encourage those interested to take some time and read through the interviews. Did you ever consider joining a large medical institution after graduating residency in an employed capacity? I never considered joining a large medical institution after residency. I never wanted to be “employed” and told where to be and what to do. What do you like best about being in private practice? What I like best is the independence and the ability to have a say in everything. If there is a problem I fix it. I would have to say the lifestyle is in some ways better and in some ways worse that being employed. The perks in terms of lifestyle is that I take unlimited days off and unlimited vacation. As long as I cover my calls, weeks of rounding, and weekends we take as much vacation as we want. The negatives on lifestyle is that I feel private practice (PP) docs work more. I round every third week and am on call every third weekend. We cover 50k patients and five hospitals. It is very busy. Also running a business requires many meetings after hours with partners etc. I feel PP allows me significant autonomy to practice medicine. Nobody tells me where to send my patients or who to refer to like some of the larger hospital systems make their docs do. I truly trust each and every doctor in my practice to cover me when I am out of town or off. This is a real big deal. I have to feel comfortable when I am gone that everything is stable. Are there measurable financial incentives? This obviously is an important issue. PP allows me to make 2-3x what employed doctors make without being forced to see TOO many patients. In a full day in the office (8:30-4:30) I rarely will see more that thirty patients. I refuse to do that. I want to be able to make my living while continuing to provide the best care possible. I do not feel that I can provide the best care possible if I am rushed and am unable to spend the appropriate time with my patients. PP allows me to do this. Part of the reason is income we make from our employed doctors and our ancillaries. You are part of a group that now is a majority stakeholder in a private hospital. In executive meetings, do physicians in your group encourage you guys to self-refer, to keep things "in the family"? Not at all. All of our patients are sent for testing, referrals, and admissions to the facitilty that best serves their needs and their medical condition. I make every medical decision for testing etc based on “where would I want my dad or mom at”. How would you respond to criticism that physician owned hospitals represent a conflict of interest for doctors, i.e. the temptation to self-refer can be overwhelming? What can be done to counteract these sorts of accusations? Anytime a physician has a financial stake in anything there will be concern. Even surgeons can be questioned when they make a decision to do a procedure. Is that procedure really needed or is it because the surgeon makes money doing procedures? The same thing with our hospital and with in-office ancillary services. Anytime I refer a patient to someplace I own I disclose to them my investment. I answer any concerns and it is ultimately up to the patient where they want their testing. We have posters and postcards explaining our investment. This has created very positive dialogue with our patients. I have yet to have a patient have a problem with our investment in Summa Western Reserve Hospital. They understand that we RUN the hospital. We are on the Board of Directors and one of my partners is the CEO. Ultimately their experience in that hospital reflects on me personally. To counteract the criticism we have to run the hospital the right way. Treat patients with respect and continue to make sound evidence-based medical decisions. I urge neighboring hospitals to review average length of stay for my patients at all the hospitals and they will see that there is no difference in how I practice medicine at my hospital or at other hospitals. We invested millions of dollars in this hospital venture so there obviously is expectation of dividends. This will take years to realize. Nobody is going to get rich with this. I think we all see the bottom lines of hospitals in this region. This investment ensures me a say in how my hospital is run. It ensures real accountability for patient care and outcomes. It allowed us to immediately improve patient care by getting highly-skilled subspecialists to practice there that were not involved in the past. Only time will tell. I am extremely proud of this venture and none of us hide this fact. How do you feel about doctors owning radiology equipment (MRI, CT scans, Stress test labs etc)? Is there a nudge in the back of your mind to "overutilize" for equivocal indications? We currently own all of the above. Our data over the past few years has not shown an increase in the number of tests ordered. Stress tests are routinely reviewed by the cardiologists for appropriateness of testing. We have checks and balances in place that monitor our referrals for testing. Sure, more of the testing goes to our facilities. We use state of the art equipment that is similar to what is at the hospitals. We had a quality issue once with one of our ancillaries and we stopped referring to it for months until we could get another doctor to read the tests better. Again I would send any family member to be tested at all of my ancillaries because I truly feel we do as good a job or better than other facilities. Remember when you order a test you have to deal with the result. If you send patients for equivocal indications you run the risk of running even more tests to CYA. You still need to assess pretest probabilities etc. I don’t order a stress test if I am not going to believe the result (positive or negative). What drawbacks do you perceive about the Cleveland Clinic system (or other typical large salaried groups) in terms of how physicians are organized, paid, rewarded? There really is no drawback for me personally. Subspecialists like yourself I am concerned about. Hospital owned physician groups in my opinion may be pressured to refer within the “family” for subspecialists and testing. I am sure there is much more pressure to do this that in private practice. In fact those doctors in hospital owned groups may not even have the ability to send their patients somewhere else for testing or referrals. Do you feel this momentum gathering for healthcare reform puts future entrepreneurial endeavors like the one you are engaged in at risk? Absolutely it does. There are decisions that the government could make that could put me out of business. If that happens I plan on moving to the Caribbean and working for cash. I refuse to be forced to see 40 patients a day to make half of what I make now. I would rather sell it all and move to some island or rural town and live a simpler life. How likely is it that physicians will be able to pursue these sorts of free market opportunities in the future given the apparent direction our federal government is going? This question is very hard to answer because I truly do not know what will be passed. Wait and see approach. I am pretty sure though that free market opportunities will be less. Jeffrey Harhay is board certified in internal medicine. He has been employed by the Cleveland Clinic since finishing residency 5 years ago. He states that, despite working for the evil empire, he does not have to dress up in special stormtrooper gear every day for work. (Just teasing). What factored in your decision to choose to work for a large academic institution like the Cleveland Clinic rather than going into private practice? 1. Availability of an electronic medical record. I was fortunate enough to see the benefits of a sophisticated electronic medical record during part of my residency at the VA. Say what you want about the VA, but you cannot beat their medical record system. Everything was integrated, from viewing CXR in the resident team rooms to dispensing prescription directly to the pharmacy from the ER. It really was seamless. It definitely beat tracking down paper charts that I had grown used to at University Hospitals. So having a user-friendly EMR was important. 2. Lack of private practice opportunities in Cleveland. If you want to practice primary care in greater Cleveland, you pretty much have to align yourself with the one of the big three (CCF, UH or Metro). Practicing in Cleveland was important to me, as both my wife’s and my family are rooted here. 3. Protected time off. This is tough to achieve in many private practice settings. As a salaried physician at the CCF, I am allotted 4 weeks of vacation and 2 weeks of CME (which may include 2 reimbursed trips within the U.S. to attend CME conferences of your choice). This is addition to all national holidays off. I also have the support of a “nurse on call” service which fields all patient calls and triages them appropriately according to physician approved protocols. As a result, only about 10% of the calls need direct physician input, which is directed to the on call physician. What this means practically, is that when I leave the office at 5 p.m., I leave the office. Are you satisfied with your present compensation and overall work situation, i.e hours, expectations, time off, CME etc. In general, I am not pleased with the compensation of primary care as a whole. Currently, reimbursement is procedure based, not cognitive based. Unless that changes, primary care providers will continue to be underpaid. Specific to my present compensation, I am satisfied. I definitely took a lower initial salary when I started, but I believe I was up to par with my colleagues after 2-3 years. When you take into account malpractice coverage, health benefits, life insurance and retirement contributions (approximately an additional 6% contribution into 403B & Cash Savings Plan), it gets pretty close to private practice compensation. I am expected to see patients 38 hours a week with a half-day Saturday once monthly. In our current group, there are no inpatient responsibilities as our patients are cared for by hospitalists. Essentially I see patients from 8 to 5 and one Saturday a month. This setup is very family friendly. To me, this was more important that an incremental increase in earnings that I could make elsewhere. Did you explore higher paying jobs in the private sector? I did. I explored a rural based practice that would have come with a $20,000 signing bonus plus a higher starting salary for 2 years. But essentially I would have been acting as a solo practitioner, being on call 7 days a week. If I wanted coverage for a weekend, I would have to coordinate that with another physician in the area. Another academic based practice guaranteed 2 years salary, after which I would earn what I billed. Many of the physician in the setting were frustrated with the variable expenses they were responsible for on a month to month basis. They would have to go line-by-line on a monthly overhead statement, which they had difficulty interpreting. In this model, if you took vacation, you did not earn while out of the office. To me, this seemed like an inherent disadvantage to take time off. I knew that I could not truly enjoy taking a week off knowing that I was “losing” $500-$600 per day. I doubt I would take more than a week off in this type of practice model. Do you feel there is an expectation to practice medicine a "certain way", working as an employee for CCH? I don’t feel I have any more expectations placed upon me than a private practitioner. Namely, putting the patient’s concerns and needs above all other priorities. If this means consulting a specialist outside the Clinic in order to get the patient seen in a timely manner, so be it. Obviously, we try to refer within the Clinic as much as possible. How much of a role do "cost effectiveness" issues factor into your clinical decision making and have you ever been censured for ordering "unecessary tests"? Almost never. On a rare occasion (probably 2-3 times in the past 5 years) I have received a letter from a senior reviewing physician on the cost of a visit / workup of a Cleveland Clinic employee. It is usually accompanied by an evidence-based article advocating a more cost effective approach to managing a particular issue. For instance, I received such a letter after ordering extensive serologies on a young patient recovering from viral myocarditis. In retrospect, the labs did not effect the treatment of the already convalescing patient, and probably were not necessary. Is team-oriented clinical care emphasized at CCH, ala the Mayo clinic, or is that just a bunch of hype? It is really true, and probably one of the most unique and beneficial aspects of receiving care at the Clinic. As an internist, I am expected to be a jack of all trades, but master of none. I rely heavily on my specialist colleagues for guidance in difficult patient issues. Let me give just a few examples in the past several weeks. I have often called down to the radiologist on the first floor to review an x-ray of a patient I am seeing in the office. Essentially it allows me to get an instantaneous radiology read. 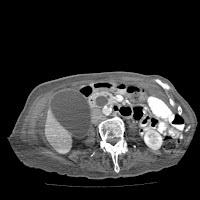 I have asked the pulmonologist in the office adjacent to me to review some borderline mediastinal adenopathy on a CT scan in a patient he has never seen. He deems it to be insignificant and thus saves the patient the cost and inconvenience of a formal consult. The pulmonologist is no worse off, as he is salaried as well. Many occasions I’ll run downstairs to review an ECG with the cardiologist and bounce a few questions off of him on how to manage a particular patient. More then once I’ve grabbed the dermatologist to take a look at rash I’m not sure of. And I have many more examples. The one common theme is that never have any of the consultants / radiologists seemed put-off or perturbed by my request. And by sharing the same EMR, there is seamless communication and flow. I have never had to look for a lost consultant note. I am able to avoid ordering redundant labs, which saves money. No need to order a lipid panel and ALT, if the cardiologist did just 2 months ago. I truly believe all the Clinic docs buy into the team approach. How do you do specialist referrals? Is it simply of matter of plugging patient name into computer and an appointment is spit out? Or do you always call the consultant? Do you use docs you like or are there recommended guys "in the system" you generally use? In our FHC (family health center) building, we have a full array of specialists with whom we are familiar and often refer to. Specifically in the building I work, there are dermatologists, rheumatologists, neurologists, urologists, nephrologists, heme/onc, general surgery, plastic surgery, orthopedics, radiologist, ob/gyn, gastroenterologist, cardiologists and ENTs. I am familiar with every single one of them and could call them to see a patient urgently without any resistance. For routine consults, a computer order is placed and the secretaries schedule the appointment for the patient. There is no need to speak to the consultant for routine consults, as we all share the same chart. No films for the patient to misplace, as it is all electronic. What do you think are the benefits to being in a salaried position for a large medical group? Talk about anything. Patient care. Cost. Personal satisfaction. Quality assurance. Professionally, I strongly believe the EMR gives me a tool that allows me to improve the quality of care that I provide. After 8 years of college and 3 years of residency, I think most internists start off with a similar skill set. The EMR allows me to continuously self assess the care that I provide. And it allows me to do this objectively. Let me give you an example. Every quarter, each physician gets a report on his/her certain disease outcome measures. One can see how they compare to his/her colleagues in the building as well as the CCF average. So I am able to see that my diabetic HbgA1c (a reflection of glycemic control in the previous 3 months) average is better than the most in the building, but perhaps my blood pressure control in those patients is sub par. I am then able to take action to improve these numbers. I can pull up a list of all my diabetic patients with BP of > 140/90, and have my medical assistant call five patients a week to schedule a follow up or a nurse visit for a BP check. If I see that my pneumovax rate is less than 90%, I can create a list of these patients and have letters sent to them. Of note, these measures are not used against physicians. If there is a physician with some outlying measurements, a non-confrontational, constructive approach is taken to see how the support staff and physician can work together to improve the quality scores. I know it’s hard to believe that physicians are not threatened by being “graded”, but in my experience, it is just not the case. Most physician welcome the insight as to what they can do to improve their practice. That is why I think it is so vital that governmental health care efforts continue to provide incentives for the continued expansion of the electronic medical record. Personally, working at the Cleveland Clinic affords me the greatest opportunity to raise a family. That aspect is very important to me. Most days I work 9 hours a day, and I home by 5:30. I am not bogged down with the management aspects of running a practice. I do not have to worry about billing, scheduling, the hiring and firing of ancillary staff, overhead cost, etc, etc. My job is to focus on being a clinician. Nothing more, nothing less. Yes, I sure I make less money than many private practitioners. I assure you that I definitely have less aggravation and stress than most private practitioners. What price can you put on that? Do you ever feel your autonomy is compromised to some degree working for CCH? Sure, in certain circumstances. For one, all Cleveland Clinic physicians go through a yearly professional review. This entails reviewing your productivity (as reflected by RVUs), patient satisfaction scores and quality data. I can say that I have never had a problem with any of these measures in the five years working for the CCF. These reviews also allows me the opportunity to give feedback the medical director and department head. But ultimately, I have a boss, which inherently limits my autonomy. More trivial things include the requirement of a 30 day notice to take a vacation day. This is to minimize patient inconvenience, but does not allow for a spur of the moment afternoon round of golf. It is a bit frustrating when you plan a day off a month in advance, then it happens to rain the whole day. Is it your feeling that private practice docs tend to be more financially incentivized than employed docs? Certainly. In some cases this is beneficial and in others it is detrimental. As a salaried physician, when my schedule is full and I have already added on a couple of patients, I am less inclined to add on more patients that a private practitioner. This adversely affects patient access. Conversely, I think I am going to be less prone to order a nuclear stress test on a patient with atypical chest pain than the private doc whose practice owns their own scanner. I do not see how any physician can act entirely unbiased if they have a financial stake in the tests that they are ordering. Steele said he does not regret that Republicans such as Sarah Palin and Newt Gingrich raised the “death panel” issue. Asked if he thinks there is a “death panel” provision in the bill – a suggestion that has been proven untrue and that the White House has spent a week trying to knock down – Steele said he does not know. From KevinMD, Dr. John Horstkamp has a piece detailing his ideas for fixing the primary care shortage in America. With universal coverage of all Americans seemingly on the horizon in some form or other, now would be a prudent time to address a very disturbing question: will we have enough doctors to take care of the influx of new patients? Less than 5% of graduating medical students are entering primary care fields. The reason most cited for this phenomenon is the relatively low remuneration for primary care compared to subspecialist physicians. Dr. Horstkamp feels that substantially raising the reimbursement rates for cognitive medicine is the only viable solution. And by substantial, he isn't kidding. In the reform bill floating around DC now, there is a proposal to raise Medicare reimbursement rates by 8-10% for primary care docs. This isn't going to cut it, according to Dr Horstkamp. He wants fees raised by 30-70%. If you're thinking to yourself--- "wow that sounds really.....ridiculously, absurdly high"--- well, you're right. It is absurd. It's a juvenile, disingenuous entreaty for "equality". Let's delve into it. His first error is the premise that all doctors are alike. Specialists can generally earn $100,000 more per year than most primary care providers. They also train longer, face higher malpractice premiums, and often endure higher levels of stress and personal strife. Over the course of a career, that difference can mean an additional $3 million dollars in earnings. One response to this actuality is to be morally appalled (the horror, the horror! The GI doc just made 400 bucks for a fifteen minute EGD!). Another is to say, so what? So there are discrepancies in how the market decides to remunerate certain kinds of doctors. Big deal. I just don't think you make any meaningful reform-minded progress going down this pathway. There will always be unfair differences in the way people are paid in a free and open market. Maybe our inner city schools wouldn't be such a collective cesspool if teachers made six figures. Or maybe indigents standing trial would get a better defense if their court appointed attorneys were paid the same as the Wall Street corporate lawyers (i.e. sharks). But you don't know for sure. And simply equalizing all salaries across the board is an overly simplistic solution to an incredibly complex reality. Demanding a 70% increase in pay just comes across as an unserious plea for fairness. It's like the fireman complaining to his boss about how Michael Vick just signed a million dollar contract. Yeah, it probably isn't right that a convicted felon/dog torturer makes ten times as much as the guy who pulls innocent grannies out of burning apartment buildings, but hey, that's the way it is. It's the dark side to free market capitalism. No doubt, we can remunerate cognitive medicine far better than how it is now. And I think the 8-10% increases articulated by the bill are a great start. And student loans ought to be forgiven for ANYONE who goes into primary care, not just those who agree to take jobs in Cody, Wyoming. So now you're changing the terms of the argument. All of a sudden, primary care rebrands itself as a well-respected profession with earnings $150,000-250,000 and no student loan debt to worry about. You get to be a family doc. You work hard. You don't owe any money. You're going to be able to live the upper middle class suburban life. What's not to like? But here's the thing with increasing pay for primary care docs. The practice of medicine must concommitantly change. I've written about this before. It can't be business as usual. No more shotgun consults. No more rushing through 45 patients during office hours and shunting off any complicated patients on subspecialists. No more referring all your asthmatics to pulmonologists. No more pawning off your stable type II diabetics on endocrinologists. No more dermatology referrals for obvious benign moles. There has to be a change in the practice of primary care medicine. So if we increase remuneration for cognitive medicine, it ought to allow docs to spend more time with their patients. And this may mean that average income won't change at all because they're seeing fewer patients. From MedCity News, the Cleveland area pharmacist who pleaded no contest to a charge of involuntary homicide in April in the death of 2 year old Emily Jerry (after carelessly approving a deadly saline solution mixed by his lab tech), has been sentenced to 6 months in the county clink. I wrote about this case a couple of months ago. I'm still troubled by the idea of cases like this setting a precedent for the criminalization of medical malpractice. Eric Cropp was a bad pharmacist. He did a lousy job supervising his staff. He'll never work as a pharmacist again. But it seems that the circumstances surrounding the death of Emily Jerry suggest more of a systemic deficiency (lack of adequate oversight, unclear credentialing for lab techs, absence of multiple levels of scrutiny, etc.) than a true instance of malicious, criminal conduct by a single man. You wonder if the age of the victim and all the attendant emotional turmoil that the death of a child can incense had as much to do with the decision of the prosecutor to proceed with a criminal trial as the act of negligence itself. It started as a small perianal abscess. She didn't seek medical attention, hoping it would just go away. The swelling increased, the pain worsened. She started getting dizzy and nauseous and lightheaded and one night passed out after going for dinner with her family. When I saw her in the ER she was frankly septic and in extremis. Antibiotics and fluids were commenced. I rushed her to the OR. Fournier's gangrene is a devastating condition. The only hope for cure is rapid, definitive surgical debridement. 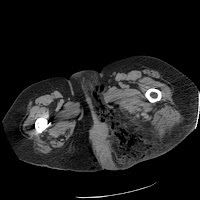 The CT above suggests the degree of gas gangrene extension in the gluteal and peri-rectal soft tissue spaces. There's nothing fancy about this surgery. You cut and debride until all the necrotic fat and skin and muscle is gone. It leaves a horrible wound. Sometimes you have to divert stool with a colostomy to facillitate clean wound care post-operatively. These town hall meetings are really quite cringe inducing. It has to be hard for some of these senators to keep a straight face during the Q&A sessions. (Socialism like in Russia????) I know I'm going to come off sounding like an intellectual elitist after this post, but, my god, I'm appalled by the crudeness, belligerence, and overall ignorance coming from the health reform protestors. I mean why are they all shouting? Why are they buying into this b.s. about "death panels" and "pulling the plug on granny"? And the incoherence of some of the rants (I don't want the federal government getting involved in my Medicare!) is just stupefying. Health care reform, we can all agree, is an issue of paramount importance currently. We all have a stake in it. Our current market-based system is costly, inefficient, and excludes large swaths of the population from its benefits. It is hard for me to comprehend how one could take the stance that no changes are necessary. There is undeniable room for improvement. What ought to be debated is the extent to which change should be implemented. But what we're seeing at these town hall meetings (which are just overflowing with average American citizens, genuinely interested in and concerned with the perceived proposals) is not a legitimate form of rational discourse. Nancy Pelosi phrased it poorly (i.e. the protestors being Un-American) but she has a point; public debate requires more from participants than the shouting of slogans and propaganda. A participant in the public debate of an issue of this magnitude has an obligation to arrive at the debate well-informed. Raising your voice, hurling invectives, and spouting nonsense really don't cut it as legitimate forms of opposition. This isn't the Jerry Springer Show. 1) Nothing and no one is immune from criticism. 2) Everyone involved in a controversy has an intellectual responsibility to inform himself of the available facts. 3) Criticism should be directed first to policies, and against persons only when they are responsible for policies, and against their motives or purposes only when there is some independent evidence of their character. 4) Because certain words are legally permissible, they are not therefore morally permissible. 5) Before impugning an opponent’s motives, even when they legitimately may be impugned, answer his arguments. 6) Do not treat an opponent of a policy as if he were therefore a personal enemy of the country or a concealed enemy of democracy. 7) Since a good cause may be defended by bad arguments, after answering the bad arguments for another’s position present positive evidence for your own. 8) Do not hesitate to admit lack of knowledge or to suspend judgment if evidence is not decisive either way. 9) Only in pure logic and mathematics, not in human affairs, can one demonstrate that something is strictly impossible. Because something is logically possible, it is not therefore probable. "It is not impossible" is a preface to an irrelevant statement about human affairs. The question is always one of the balance of probabilities. And the evidence for probabilities must include more than abstract possibilities. 10) The cardinal sin, when we are looking for truth of fact or wisdom of policy, is refusal to discuss, or action which blocks discussion. Right now hospitals, they are not penalized if there are constant readmission rates from patients that have gone through the hospital. If you go to a — if you go to a car company or a auto shop, if you say, “Can I have my car repaired?”, you get your car repaired — if two weeks later it’s broken down again, if you take it back, hopefully they’re not going to charge you again for repairing the car. You want them to do it right the first time. And too often we’re not seeing the best practices in some of these hospitals to prevent people from being readmitted. That costs a lot of money. So those are the kinds of changes we’re talking about. Amen. It's like when I buy a Chalupa at Taco Bell and I get home and it's too cold or there's not enough lettuce in it or the sauce is leaking out the back. So then all I have to do is bring it back and they give me another piping hot, non-leaky chalupa for free. I mean, I already spent 89 cents. Why should I spend another 89 cents when they didn't do it right the first time. Or if I get a haircut and when I get home, my wife tells me I look like they hacked at my rats nest with a dull lawnmower blade, all I have to do is go back and they fix it for free. I mean they didn't do it right the first time. Why should I pay them again? I don't get these hospitals and doctors. You mean to tell me a human being is more complex than a chalupa? Or a bad muffler? You gotta be kidding me. And I don't want to hear about how some patients are only approved by Medicare or their insurance company for a three day admission. You can always lie, right? Just write in the chart something along the lines of "patient still inexplicably not 100% healthy, need at least another week in the hospital". It's so easy. You'd think these doctors and hospital CEO's with their fancy degrees would have figured it out by now. That's right, Obama is planning to create secret "Death Panels" that will deny coverage to the elderly and handicapped based purely on eugenicist principles. And then she links to the Queen of Loony Tunes herself, Congresswoman Michelle Bachmann, to lend credence to her distorted interpretations of Obamacare. Nice try Sarah. They're going to love you on The View and Fox and Friends. What we keep hearing from the right is mere opposition for the sake of opposition. Where are the substantive criticisms of HR 3200? Why isn't anyone asking about medical malpractice reform? Or student loan subsidization to encourage medical students to go into primary care medicine (and not the loan forgiveness written into the bill as it stands now where you are obligated to go to underserved areas, i.e. Nowheresville, USA in return for the government's largesse). There is plenty to debate. But rambling on about death panels and euthanizing granny only serves to marginalize those who have legitimate concerns with the bill as it now stands. What to do? Abolish the entire medical-malpractice system. Create a new social pool from which people injured in medical errors or accidents can draw. The adjudication would be done by medical experts, not lay juries giving away lottery prizes at the behest of the liquid-tongued John Edwardses who pocket a third of the proceeds. Reform med mal and we'll save billions. Just you watch. 2)Tax employer-provided health benefits and return the cash to individuals in the form of a tax rebate that they can use to purchase their own coverage. No longer will one feel beholden to a job one loathes because of the benefits. This one doesn't light my fire the way tort reform does (you still need a job that offers benefits in order to qualify for that rebate). And those without jobs will still be essentially "free loading" off those who are fortunate enough to have a gig with benefits. So all is not perfect. But it's a start! At least the right is starting to creep into the light of rational discourse. There's hope yet. A nurse called me the other day to notify me that a patient's stool sample came back positive for the c. difficile toxin. I told her to start the patient on the usual treatment regimen (oral vancomycin, or po/IV metronidazole). Then she asked me if I wanted to get an ID consult. Why would I do that? I asked. I dunno. That's what everyone else does, she said. More artillery in JACS from Dr. Morrow's group on the lack of evidence to support routine MRI in the pre-operative evaluation of women with breast cancer. A side note: I was seeing a patient recently with recurrent breast cancer. She had had breast conservation surgery for a T2N1 lesion ten years ago. Now she presented with bone, kidney, and lung metastases. A mammogram demonstrated diffuse inflammatory changes of the affected breast. The official radiology reading suggested an MRI to better delineate any occult masses. 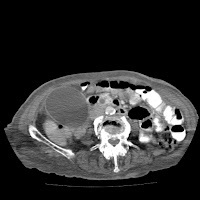 After consideration of the options, the patient elected to decline further chemotherapy and will pursue palliative care.